Interrogator: Show them the courage of Allah! Q: What is "Robin Hood: Prince of Thieves" about? Q: What are the differences between the theatrical cut and the Extended Edition? What about the UK Extended Edition? Is it uncut? The legendary Sherwood forest's hero Robin Locksly (Kevin Kostner) again and Lady Mariam (Mary Elizabeth Mastrantonio) along with a Moor (Morgan Freeman) and his Merrie men : Will Scarlett (Christian Slater), Friar Tuck and Little John facing off a wicked Sheriff of Nottingham (Alan Rickman) and Guy Gisbourne (Michael Wincott). The story is indirectly based on historic events and developed during third Crusade , Robin is imprisoned and is serving under orders of Richard Lion Heart (Sean Connery) who fights against Saladin and conquers Acre . In route England Richard was captured by Leopold II of Austria and ransomed by his own subjects . 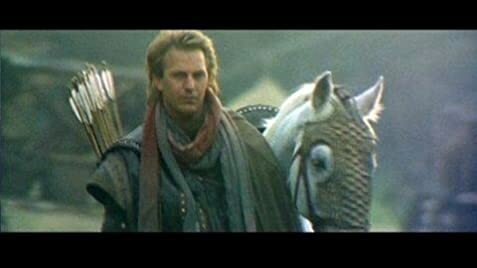 He briefly returned England to put down a revolt against him , his brother John without Land takes over the kingdom with his underlings Sheriff of Nottingham (Alan Rickman) and Guy Gisbourne (Michael Wincott). One time evaded Robin and returned to England he'll confront against the former . The movie has great action sequences well staged with stylish and vitality , tongue-in-cheek , adventures , romance and is pretty amusing . Although is a little revisionist about characters , personages and time where is developed the action in a dirty , gritty Middle Age, spectators partially disapproved the changes of classic canon . Seven years later to ¨Fandango¨ film , director Kevin Reynolds and Kevin Costner re-teamed but with much bigger budget . The final product looked as although the actors learn the screenplay and decided the best issue was to take a good time and amuse themselves and both managed to stage some excellent action scenes , hopefully without coming to blows themselves . Kevin Costner is fine but Morgan Freeman comes up the film as the civilized and naive Moor brought by Robin from Crusades . Special mention to Alan Rickman as an evil and crazed sheriff in a comic and sensationalistic interpretation . Mary Elizabeth Mastrantonio is memorable and attractive . Impeccable cinematography by Douglas Milsone . Movie is shot on natural sets and English woods and cathedral and interior scenarios with impressive production design . Magnificent and spectacular musical score by Michael Kamen . The song ¨every thing I do it for you ¨ was nominated for Academy Award . 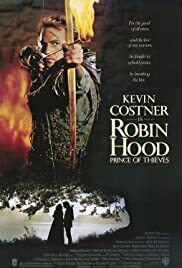 The same year was exhibited ¨Robin Hood¨ by John Irvin with Patrick Bergin and Uma Thurman but was a flop though the critics considered a best adaptation . The classic rendition is ¨The adventures of Robin Hood¨ by Michael Curtiz with Errol Flynn and Olivia de Havilland.